In the times when diseases came into a certain area, people slept on hammocks because they reduced the possibility of transmitting contagious diseases. Nowadays, when speaking of hammocks, it is meant of a hammock tent. They are usually covered with a mosquito net, which adds up to the safety features of the hammock itself. 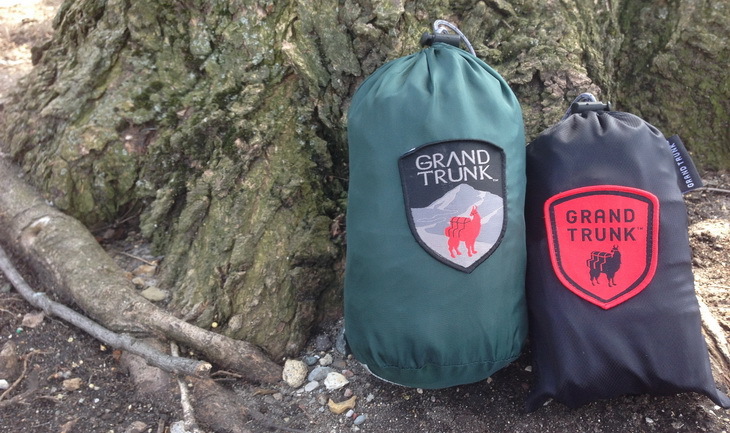 The Grand Trunk Skeeter hammock is the most useful thing on the market. It is a product invented for adventurers who love the nature. It is the perfect choice for people who don’t feel too safe in a tent. Nevertheless, in order to have a positive hammock experience you have to choose the right one for you. So, sit back and weigh up the advantages and disadvantages of the hammock and decide yourself if this is something you wish or need. The only thing between you and the outside is a mosquito net which is protecting you from bugs. The problem is, it is not very suitable for cold weather conditions for the very same reason. Even though, manufacturers are putting a great effort in improving the breathability in the tents, the hammock has a natural breathability system. This means that it is not at all closed and you are free to breathe the outside air while sleeping. This said, the hammock is perfect for warmer climates and higher temperatures, but the tents still have no competition when the temperatures drop. Convenient and multi-use – ideal for relaxing when camping, hiking or traveling. High quality and durable – the hammock is made from 100% parachute nylon. Another important difference is the ground surface, or the lack of one. When sleeping in a tent, even though it is warm outside, you should still have isolation since the ground temperature is always cold. With the hammock this problem is naturally solved. The only thing underneath you is the air, which means that you won’t need to wear an isolation pad. If you are a camper, there is a great chance that you are an adventurer who is ready to “risk” it and head out into the nature without your “safer” option and consider trying a new way of camping. Some even say the innovative way of camping. In this buying guide, we will explain the differences in the two ways of camping and explain all there is about hammocks. 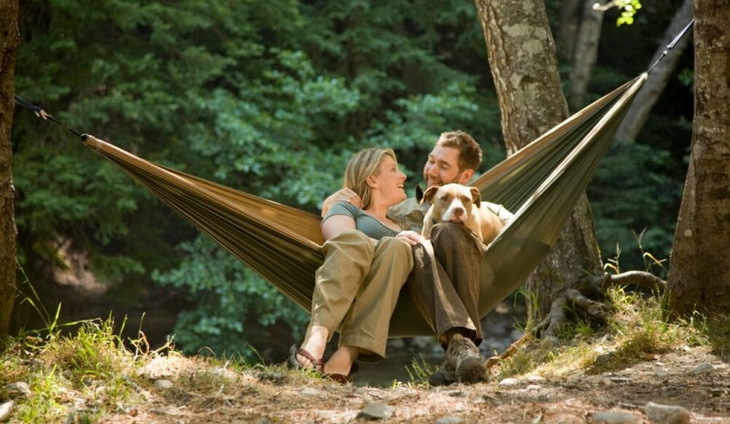 We will even offer a hammock which is the best deal out on the market. 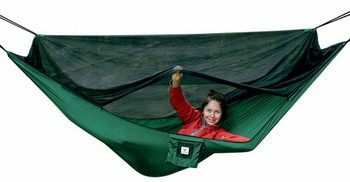 The weight of the hammock with the net, straps and all its components is 1.8 pounds and it sizes up to 8 x 5 x 5 inches. As for the weight it supports, it is tested with 300lbs and it does hold up. The label stated capacity is 400 pounds. The packaging is small and durable, and weighs in at 2.6 pounds when shipped. It will come in a box that is 8 x 8 x 8 inches. Out of the box, you will notice the hammock is made of nylon material, which is strong. The size is for one adult person or two kids. It could also fit one adult and one small child, but it would feel a bit tight. It is pretty spacious, and it has enough place for a person to read a book without the claustrophobic feeling which is common for the hammocks. It is even spacious enough for tall people, which is very rare feature in a hammock. There are also zippers on both sides, so you would have the possibility of opening the one side and leaving the other closed. The net is not detachable, so in case you want to use the hammock without the net, you could unzip the zippers and flip over the net so that it lies at the bottom of the hammock. The downside of this hammock is that it doesn’t come with a rain fly, so if it starts to rain you would have to find another cover. Otherwise, users love this hammock because it is strong, allows the big and tall people to use it with ease, and it packs down so easily that it can fit right into your backpack. Do not forget, you can choose which color you want as well! Take your pick between Olive Green and Khaki, Navy and Forest, or Woodland Camo! Not only is this hammock simple to use, but it assembles in just minutes! The package comes with all of the items you need to hang your hammock between 2 trees that are 12 to 15 feet apart. Once you get the suspension together, you can use the ropes and carabiners to attach the hammock and simply get in and enjoy! If you want to close the mosquito netting, simply zip the flap closed! Getting inside is a cinch, as long as you have the hammock at chair height so you can simply sit down and slide in. This specific hammock provides protection from bugs like mosquitoes that can attack you and cause the Zika virus and much more as they carry viruses within them. During nice days, where there are no bugs or pests present, you can leave the mosquito net flap open and enjoy the sun. Most people who are campers don’t have the fear of bugs. However, there are many that do not. 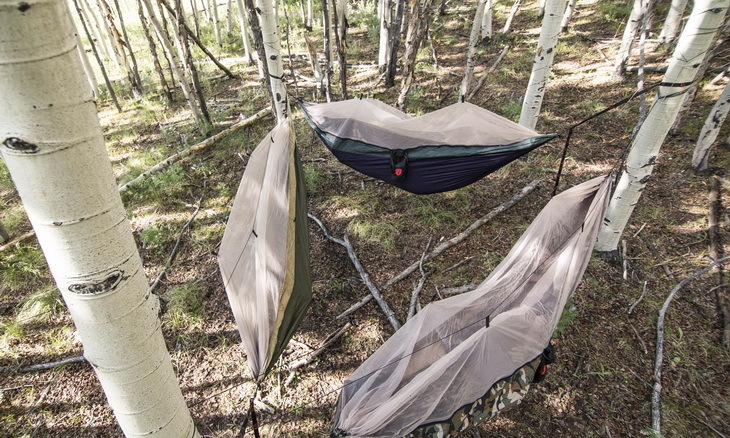 For this reason, the hammock provides you the perfect shelter from bugs. The fact is, most bugs come from the ground. If you avoid the touch with the ground, you have avoided most of the chances to encounter them. If you are afraid of the bugs, this would probably be the most important feature in a hammock. The cleaning of the hammock is an important process which should be considered before buying it. With this hammock, you should first remove the carabiners and then wash it by hand with detergent. Keep in mind that this hammock is not recommended for it to be machine washed or machine dried. Another thing is, you need to be sure there are no sharp objects in your hammock with you, as this can puncture not only the nylon, but the mosquito netting, causing it to rip apart. While the materials made for this hammock are quite durable, you do have to be careful with sharper objects around the area of the hammock. While there are many hammocks on the market, some cheaper than others, this hammock comes in at a moderate price for such great quality. Many users say that it has already been worth the money spent as it is strong, lasts a long time, and is problem free! Amazon users have given this hammock 4.5 out of 5 stars because of the great value it has for the price, among other fantastic features. You can surely get a lot of use out of this hammock when the weather is lovely! Below, we are going to show you three product reviews of similar products that are on the market currently and show you how they stack up to the one we have reviewed above. Showing you what other hammocks are out there can help you compare to the Grand Trunk Skeeter Beeter Pro. The Eagles Nest Outfitters JungleNest Hammock has 950 square inches of bug netting, keeping you safe from mosquitoes and more. This hammock can hold up to 400 pounds and is made of nylon taffeta for durability and a long life. It packs down small, to 6 x 7 inches, but when unfolded, it is 9 feet 4 inches by 4 feet 9 inches and it weighs only 29 ounces. Easy to put together, you can securely attach it to trees, poles or a wall for a relaxing time. The down side is that this hammock does not come with the suspension straps, as they are sold separately from the hammock, making you spend more money in the long run. Plus, you have to use a support, like rope, to keep the netting up or it will be very close to your face. But it does come with a pocket in the stuff sack as well as the hammock, and uses say the carabiners are not heavy to use. Users did say that they stayed warm in the hammock when the weather was cold, and it was perfect for camping, backpacking, and other outdoor adventures. Uses also love that the mosquito netting was also a sun shade! Users did like that they could stretch out and did not feel claustrophobic at all! The GoRoam Outdoors with Mosquito Net is a single person hammock that lets you zip it up to avoid mosquitoes and other bugs, while still seeing out through the mesh netting. Made from Nylon, this hammock has triple interlocking stitching and can support weight up to 500 pounds. Not only is it light in weight, but is packs down easily, and can be taken anywhere, whether you are hiking, camping, or backpacking. Setup only takes minutes and you will love the durable fabric and strong materials that hold up this hammock. 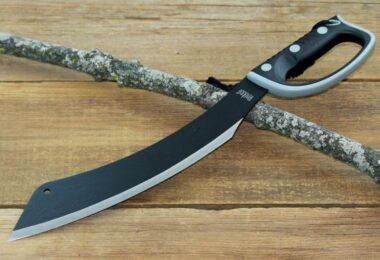 Its dimensions are 9 feet 2 inches by 4 feet 5 inches and it weighs 23.6 ounces without the straps, which add another 11.6 ounces to the weight. Users of this hammock like that it is made of premium materials and can carry a heavy load, while assembling in mere minutes. Some users had defective products that did rip and had to be replaced, but overall, users did enjoy this product for their outdoor leisure. They also said that the mosquito netting worked perfectly, on a particularly buggy day, plus it is comfortable to rest in. 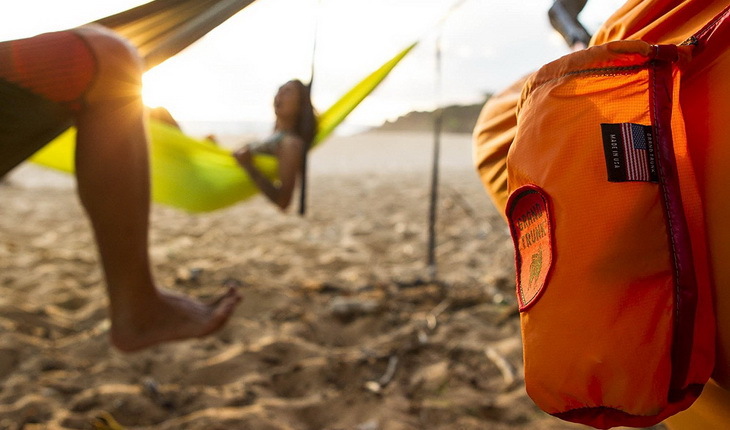 The Hammock Bliss Reversible is a reversible hammock that includes double zipper pulls and has over 2,000 holes per square inch of netting to keep out mosquitoes, fleas, and other nuisance bugs. You can use the one side of the hammock that has the netting, or you can reverse it and use it as a normal hammock if there are no bugs around, so you can enjoy a nice day outdoors. The other nice thing about this hammock is that is has a large bed area, with a length of 118 x 59 inches, and it has its own suspension system included. It weighs only 28 ounces and can hold weight up to 350 pounds. The dimensions for this hammock are 5.5 x 4 x 8.5 inches when packed down. The users say that this hammock is comfortable to rest in and they love the reversible option. Users also loved that it is spacious and bigger people even felt comfortable, without feeling too closed in. You will want to have a blanket or sleeping bag if you plan on sleeping in colder weather, however. Even users who put their outdoor gear to rough use said this hammock stood up to the abuse. 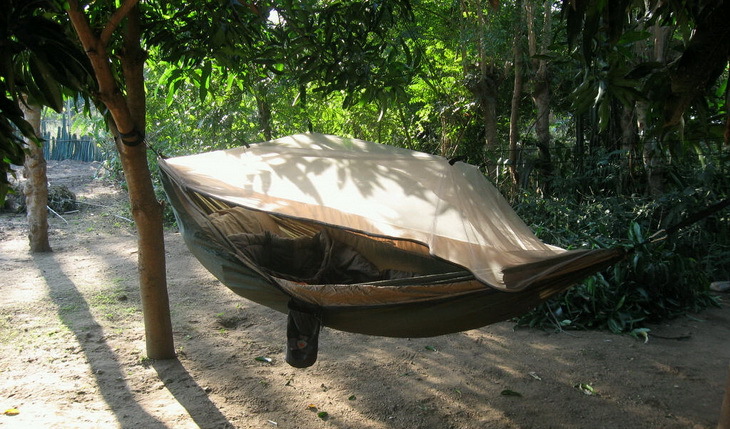 On especially buggy nights, some users sprayed the hammock with bug spray for extra protection. 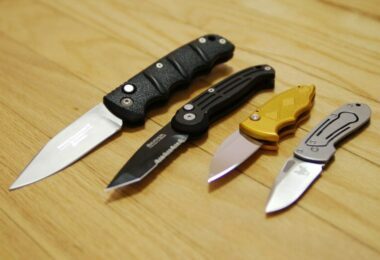 With such great quality for a great price, users were not disappointed at all. The hammock provides a great protection against animals and is especially suitable for national parks where there are bears and other dangerous animals. Even though, the possibility of them bothering you is small, there is no harm in hanging the hammock as high as you can. The straps and the material are safe for hanging at any height, or as high as you can climb. You could choose to add an additional pair of straps just to be safe, but the original straps are also very safe and with high quality. This is a one layer hammock, so if you need to, you could choose to put an extra isolation layer. In areas which are full with bugs, it is also recommended because there are cases where bugs bite through the bottom of the hammock, trying to get inside. So, another layer is not necessary, but it will certainly add to the comfort. However, this happens with every hammock, therefore it is not a downside, but a helpful advice so that you could calculate the foam or the isolation costs with the hammock. This hammock packs down easily and fits in your gear pack nicely. Easy to assemble and hang, which can be done in minutes. The price for the quality is just right. It is made of all Nylon material, which is durable and lasts over time. The mosquito netting keeps the bugs out while you enjoy the outdoors. The hammock includes triple stitched reinforcements to keep it strong. It comes in 3 colors to choose from and has a weight capacity of 400 pounds. This hammock only fits one adult person, or possibly two children. There is no rain guard included, but it can be purchased separately, so you have to prepare for the weather with this hammock. You may find that you want a sleeping pad, as a hammock does not provide a lot of padding. Some users found it harder to get out of the side entrance, where the zippers are. If you are too careless, you can rip the mosquito netting. 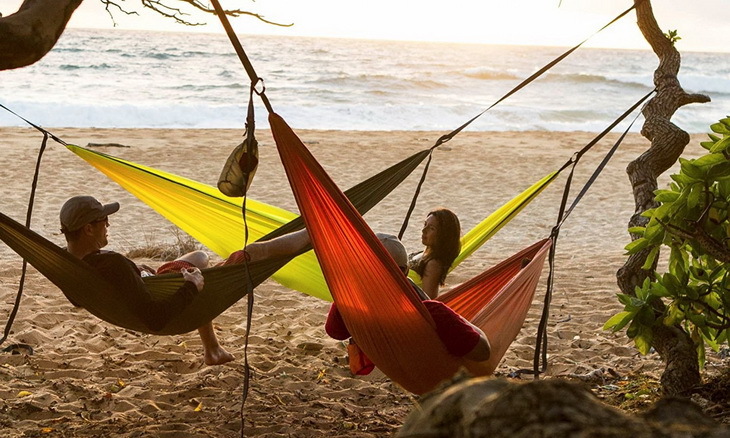 Hammocks, as all other products on the market, are not manufactured equal by every company, so, in order to avoid a negative experience, make sure you read the tips and pointers in this buying guide and choose accordingly. However, there are more professional versions of hammocks on the market with a higher price. Sleeping in a hammock is an incredible experience that everyone should try. However, keep in mind that everyone who has tried the hammock became instantly converted into a hammock camper. This hammock packs down small, yet is still highly durable and made of great nylon material that will last a long time. 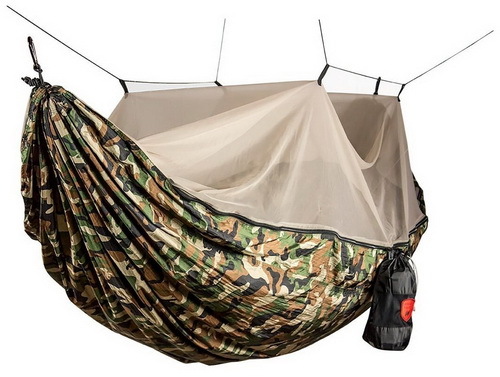 Users love the mosquito net, which keeps bugs out, and the fact that you do not need to purchase extra items to keep the hammock attached to the tree. Plus, it only takes a few minutes to attach to two trees and start relaxing! Those who have purchased this hammock love to use it when the weather is nice, and say that it is a great purchase for their camping adventures or just in the backyard on the weekend! With so many positive aspects, it is easy to see why this hammock is so outstanding. Have you slept in a hammock outdoors while backpacking, camping, or doing some other outdoor activity? What was your experience? 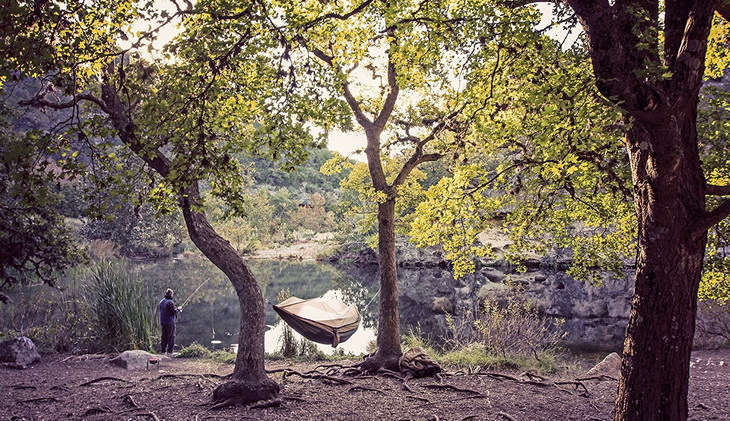 Do you prefer a tent over a hammock? We would love to hear from you. Also, if you have any questions or doubts regarding the suggested hammock or the hammock experience in general, leave us a comment in the comment section below, we would be happy to help! Happy hammock hanging everyone!